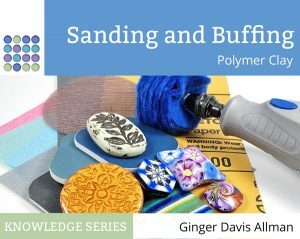 Weighing in at over 120 pages and containing 173 photos, this beautifully formatted eBook includes new navigation features, a Table of Contents, a Resources section, and three tutorials to help you learn to sand and buff with unsurpassed beauty. That was the stuff you needed to know about the new book. And now, instead of the usual promo article of “Hey, I wrote a book and it’s for sale”, I thought I’d give you a bit of a different perspective. Here’s the background on what this book is and how it came to be. I am frequently asked to write a sanding and buffing tutorial. Last summer I decided to do it. I thought it would be easy and take a couple of weeks. Easy, right? Yeah. That’s what I thought. That was seven months ago. It turns out there’s a lot to sanding and buffing. There’s sandpaper, sanding blocks, and polishing papers. There’s tumbling and tumbling grits. There’s buffing. (But what kind of buffing wheel?) There’s abrasives, polish, sealers and tapes. It just goes on and on, deeper and deeper – a bit like Alice going down the rabbit hole. I bought grits, samples, products, and machines. I tried them out on Premo, Kato, Fimo Professional, and Sculpey III. My family got awfully tired of wet piles of sandpaper and trays of drying grit. And let’s not mention the noise of my little tumbler running day and night! My studio is a wreck. Every surface is piled high. I have to clean all the mess and find a place to put all the samples, products, sanding machines, buffing wheels, and grit. Anyone want two large bags of animal bedding? (That’s covered on page 56.) The worst part was all the dust I created by testing the buffing. Although I wore a mask, my entire studio needs a deep cleaning. How many buffing wheels does a person need? Not this many for sure! But now I know which kind to tell you to buy. And if buying is better than making your own. Let’s just say I bought quite a few before I found the magic solution. And samples. 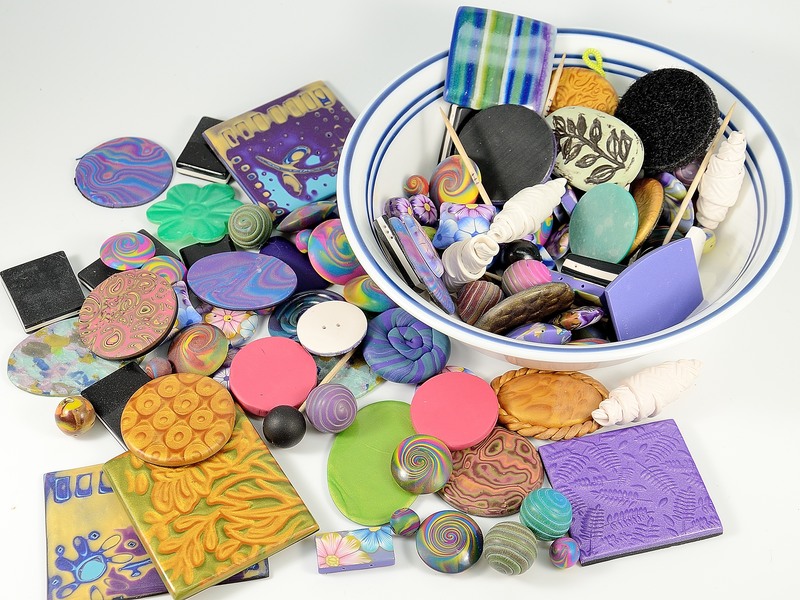 Because how do you test sanding and buffing polymer clay? You have to make samples to test. So I made a lot of beads, tablets, lentils, spirals, and tiles. There were pretty things and there were ugly, awful disasters. This is just a small part of what I made. There’s a whole bunch more I couldn’t find. I think they’re under sandpaper somewhere. But I finally got it done. Yay me! Now I’m going to go find my neglected family and try to remember what a day off is like. Cleaning the studio can be left for another day. Congratulations on finishing your book! I still don’t know what my tumbling medium is capable of, and I haven’t put a buffing wheel on my grinder yet. Way to go, exploring all the options!! Sorry my autocorrect feature somehow decided to add it’s own word. Not sure where the word wrong came from. I bought the book! How could I not with such a persuasive lead-in! LOL. In all seriousness yesterday I sanded a cabochon made in a faux technique that uses chopped up translucent clay coated in metallic ink (the no-longer manufactured Inkabilities), then sliced and polished. I wet sanded all the way through 12000 grit and STILL had fine scratches. I finally coated the thing in Liquid Fusion and called it a day. It looks so pretty, but I wanted to get there without using a gloss coat. I NEED your book! Perfect timing. Gibt es das Buch auch in der Schweiz. Ja, das ist das Buch in der Schweiz erhältlich. Sie können in der Regel bestellen. Aber das Buch ist in in englischer Sprache verfasst. Ich habe nicht eine deutsche Übersetzung. I have the book – and have read most of it already – the advice is so very valuable (and varied) and is written in such a friendly style. I recommend it to anyone who takes their polymer clay work seriously! Well done you, Ginger! Thank you Penny! There is a lot of information there for sure. Well you’ve done it again! 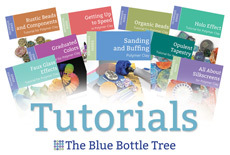 Just when I thought I had all your tutorials, there’s another Blue Bottle Tree product (a whole book, no less!) on my wish list! 😉 Congrats on finishing the book, I’ll be buying it soon and look forward to learning about your experimentations! I know that a lot of things are available overseas that we cannot get here in Australia, so I was just wondering if what things you say to use would be available outside of where you reside. Thank you for your help, as I am highly considering buying your book. Hi Jane, I only recommend a couple of products that are unusual to the clayer, and they’re definitely available in Australia. I just did a quick search, and you can get them on ebay.com.au. I was using last sheet of 600 grit, my starting grit sandpaper. Not sure if I wanted to buy more of sandpaper or micro mesh, people say its good but is it really worth it? This is when I got email that the book is available to purchase. I am sanding and buffing my stuff from last more than 1.5 years, aren’t I? Yes and I get pretty consistent results too.. Yes I was looking for some answers but I was so sure I am not going to be wowed on this topic. Oh boy.. How wrong I was and what a blow this book is to me.. In a very positive way.. So happy I decided to grab the copy. It answered what I was looking in particular.. How to better sand round beads.. But I did a double take on All about sandpaper section.. There is so much I never knew.. For a very fast reader which I am it took 3 days to read it.. Reread it.. Understand few things and order what I want from resources section. This book is a must for me now and I will be re-reading it many more times before I can understand and grasp everything covered in there. Thank you for writing such an awesome book and doing all the research. For me now it’s time to sand right. Sandpaper grits table was priceless. I bought 2 packs of assorted grits from 3m from auto shop. Neither package had P on the sizes on the outside packaging, so I planned to stop using any of my P sandpaper and just use the new graduated grits. I was very annoyed to open the packages and discover the lower number pack had P grits and the higher number pack did not have P grits. That left me with a hole between 500 and 1000 grits! I ended up labeling my P grits with their equivalent grit. I will need to get a couple of the middle grits to fill in! I also loved the idea of using the deodorant cover as a sanding handle. Unfortunately, my cover had a concave handle which was hard to grasp. I ended up baking a clay handle and gluing it onto the cover. I added the tacky stuff and it worked like a champ holding my clay piece for both sanding and polishing. I watched a couple tutorials and found one other idea that worked great for me. It suggests to cover whole piece with laundry marker. Then when it is all sanded off, you know you did a good job sanding. This was very helpful until I develop the feel I need. I use it for all cuts on my hands and it creates a nice protective coating without the stickiness. Thanks for the ebook. I would have never been brave enough to try this without it! Now I’m going to create a piece from scratch and see if I can eliminate enough blemishes to make the sanding go easier. Just a suggestion… I think maybe you should have named this book, “All the Things You Needed To Know About Smoothing, Sanding, And Polishing (and What the Difference Is Between the Three and Why All Three Are Important) Your Polymer Clay But Didn’t Know You Needed To Know”. Okay…maybe that’s just a tiny bit too long for a title, but still, it would be very accurate! This book was a revelation. I’m so glad I bought it. Have a look at http://www.riogrande.com and http://www.ottofrei.com. My computer crashed again (dead and buried) and my sanding ebook was on it. Could you can find my record of purchasing it and resend the link thing? I’d really appreciate it. Thank you so much! Hi Diane, you can go to your account (on the menu bar) to access all your purchased tutorials. Once you’re logged in to your dashboard, you’ll see the selection for your downloads over on the left.